Since he famously strolled down the escalator at Trump Tower to announce his unlikely bid for the American Presidency, most foreign capitals have been wondering what to make of Donald Trump. Is he an isolationist or someone who cavalierly threatens war? Is he the world-renowned businessman who will make a deal with anyone, or is he someone who underappreciates long-time friends and allies? The answer, as is typical in foreign affairs, is complicated. As foreign diplomats in Washington, D.C. navigate their relationship with the United States of America, they should keep in mind that America maintains core interests that transcend personality and party. Diplomats should attempt to focus on the policies that are being implemented, not necessarily the sometimes-heated rhetoric of the day. Despite all the far-reaching ebbs and flows of the past 18 months, U.S. President Donald Trump maintains a long-held view of the world. That view sees America as the indisputable leader, while it demands respect from enemies and friends alike, working to reshape the world-order to one where other nations bear more of the burden for global economic prosperity and security. The core of the emerging Trump doctrine is centered on a semi-amorphous idea of fairness. My Navigators Global business partner Ado Machida, who was Policy Director for the Trump transition team, saw this approach first hand when he supported the visit by Japanese Prime Minister Abe with then-President-elect Trump in late 2016 at Trump Tower. 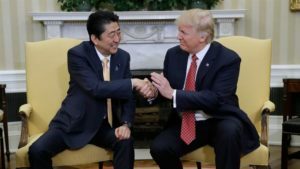 President-elect Trump was eager to develop a close relationship with a long-time ally, while he was not shy about pressing the case of fairness with Abe on trade and security issues. 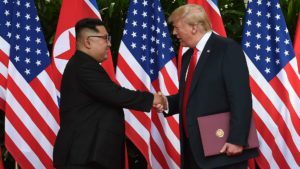 Further, President Trump, like most American Presidents before him, exudes a deep confidence in his own negotiating abilities to solve the world’s most intractable problems. We saw this back in the 1940’s with President Franklin Roosevelt and Soviet Premier Joseph Stalin, and we see it in President Trump’s dealings with Russian President Vladimir Putin and North Korean leader Kim Jong-un today. The President’s unorthodox style is perhaps best exemplified by clearly going out of his way – too far in my view – to maintain an open line of communication with Putin, while his Administration is implementing perhaps the toughest policies toward Russia since the dissolution of the Soviet Union. From the conflict in the Middle East, to solving the North Korea nuclear crisis, to preventing a nuclear Iran, there is seemingly no challenge too big for the President to try to weigh in on – often all at once. The bottom line is when it comes to the Washington diplomatic corps dealing with the Trump Administration, I would recommend working to cultivate key allies throughout the U.S. government, including in Congress, and focusing on what the Administration does far more closely than what it says. POST TAGS: Ado Machida, Congress, DC, diplomatic corps, Donald Trump, foreign policy, Franklin D Roosevelt, JOseph Stalin, Kim Jong-un, Middle East, North Korea, Putin, Russia, Trump, Trump Administration, Trump Tower, Vladimir Putin, Washington.